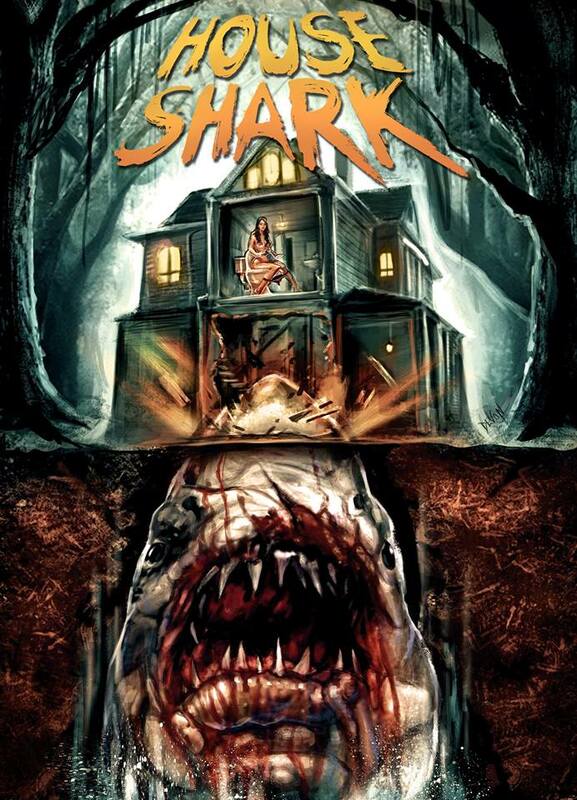 Just when you thought it was safe to go home, SRS Cinema is excited to launch their latest opus, the shark in a house movie titled HOUSE SHARK. The limited edition media, on Blu-ray, DVD, VHS, and Digital Download, are up now for presales, with plans for copies to start shipping early April. A wide release is planned for the summer. You’re gonna need a bigger house! 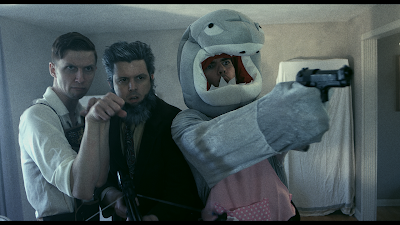 When Frank (Trey Harrison) finds his happy home under attack by a dangerous but largely unknown breed of shark, he's enlists the aid of the world's only "House Shark" Expert, Zachary (Michael Merchant), and a grizzled former real estate agent, Abraham (Wes Reid), to embark on a desperate quest to destroy the beast and claim back his life. It's JAWS in a house! From writer/director Ron Bonk ("She Kills", "Clay"). SRS have just celebrated 25 years in independent movie production and distribution, and has seen wider appeal for HOUSE SHARK than their average release. The first official trailer received over a half million views and is still going strong, and they field several requests daily as to when the movie will be available. So they’ve opted on using Indiegogo to help the movie reach new fans beyond their dedicated base, The perks are all bundled with extra items unique to the campaign such as a collectible pin, a full-size one sheet poster, and even features a last second option to come on as a Producer. The campaign officially launched this past Friday and has been red hot ever since, already having raised over 487% of its goal and often occupying the #1 spot under “film” on the platform. In addition, HOUSE SHARK is already 3 for 3 on the film fest circuit, having premiered at the Nightmares Film Festival, the #2 horror fest on FilmFreeway. It is also set to play the prestigious Weekend of Fear event in Germany and Boston’s SciFi Film Fest, which in its 43rd year is the oldest genre fest in the USA. “She Kills” DREAM DATE - signed by lead & director BLURAY, DVD, VHS, mini-poster, enamel pin, ornament, one sheet poster, just $65 shipped, limited to 5 only. "She Kills" Signed Blu-ray - signed by lead & director, mini-poster & enamel pin, just $30 shipped, limited to 10 only. "She Kills" Signed DVD - signed by lead & director, mini-poster & enamel pin, just $15 shipped, limited to 10 only.